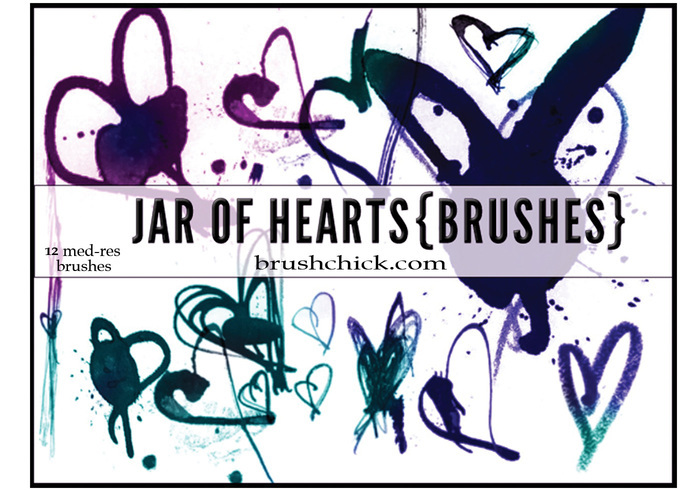 -Jar of Hearts Brush Pack by brushchick.com- 12 medium resolution grunge, hand drawn/inked hearts brush files between 360-2000 pixels each, in an .abr* file. I took some ink, eyeliner and marker to paper and started drawing hearts brushes. Not my highest quality pack, but this hearts brush pack is perfect for adding a little love to your work. View more brushes in my gallery, or at http://bruschick.com! Also, you can sign up to receive emails whenever I upload new free downloads/resources etc there ^ . Credit is welcome, but just a thank you will do!